On Monday, Israeli Prime Minister Binyamin Netanyahu spoke at a meeting of Israeli and Chinese businesspeople. Netanyahu landed in China on Sunday for an official visit in honor of the two countries' 25-year relationship. 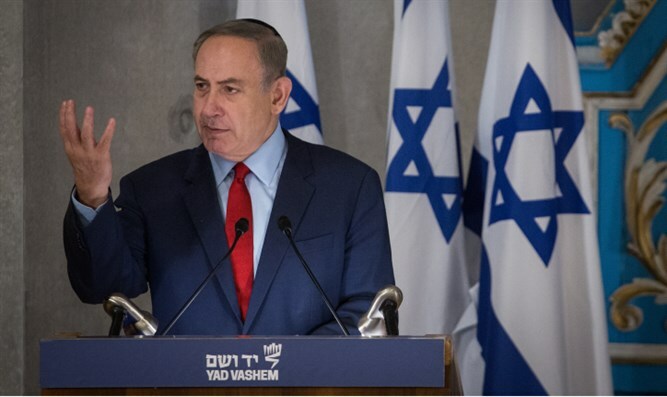 "This is a stark change from the first visit I had in China over 20 years ago, when I came during my first visit as Prime Minister," Netanyahu said. "The streets were lined with bicycles, a lot of bicycles, few cars, some new buildings, but mostly old buildings. And I have to say less smog. "You see the force, the great, enormous swirl of Chinese progress and Chinese ascendency, with all its challenges and all its problems, assume its place on the world stage in a very exciting development in human affairs and something that all nations – all nations – seek to take part of, to be partners with China, to be of assistance to China and thereby also assist themselves. "In this period, in these decades, Israel too has not stood still. Israel has moved and become one of the foremost centers of global innovation, a technological global power. It is true that we also amended our economy. We changed it. We changed it into a much freer economy, a more liberal economy more aligned with free trade principles, free market principles. "The combination of the innate technology that we had and the market economy that we built created a very powerful explosion of startup companies in various fields, drawing on military capabilities, especially in the field of IT, but rapidly expanding into other areas. "We have of course the phenomena that produces what I called mushrooms after the rain. So we have a lot of mushrooms because of this climate. It’s very conducive to getting mushrooms – startup companies that begin to grow and they’re picked. They’re picked by American companies. They’re picked by Chinese companies or by German companies. "Last week, Intel, a very large international company, bought a company, an automotive company in Israel – autonomous automotive technology, the wave of the future. It bought it in Jerusalem for 15 billion dollars. "In 2016 in Israel, we received 20% of the global private investment in cyber security. That’s 200 times our relative weight in the world population. There are 500 startups in cyber security in Israel. There are 500 startups in automotive technology in Israel. "A third area that’s developing is digital health. We have data, computerized data for just about every person in Israel, and we can merge that data and have preventative medicine. We can also do this with fewer doctors, because it can be done by telemedicine, and we can also have targeted, personal medicine because the data is so much better. "I don’t know where the next great breakouts of genius will come, but it is clear – it is clear for Israel, it is clear for China, it’s clear for everyone in the world. What is happening now is that every single field of human endeavor is becoming technological. The distinction between hi-tech and low-tech is no longer valid. Everything is becoming hi-tech.... The future now belongs to those countries who can innovate, who can upgrade their products and services for the betterment of their citizens with these new technologies. "We are your perfect junior partner for that effort. And we think there are only two such concentrations of technology in the world for the moment, and we are one of them. We are eager to work with you. We’re going to sign with the government in the coming days a series of agreements on how we can pursue this cooperation, how we can help China in its plans and how China of course can enable us to participate in its great projects. But I believe this is a marriage made in heaven."